Last Friday, the stock market, as measured by the Dow Jones Industrial Average, plunged 665.7 points. This morning, after just one minute of trading at 9:31 a.m. in New York, the Dow had bled another 307 points. You can expect a big push for the balance of the day by the shills who want to keep the dumb money in the market as a prop for the 1 percenters as they take profits and run. 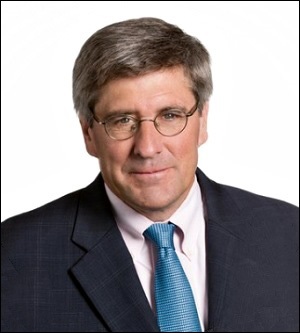 One member of the Kochtopus (short-hand for the secretive political network and nonprofit front groups backed by billionaire brothers, Charles and David Koch) is Stephen Moore, who has somehow secured himself the position of Senior Economics Analyst on CNN, the 24/7 cable news network whose tagline is “The Most Trusted Name in News.” After the market plunge on Friday, Moore was on air at CNN by Saturday afternoon urging the little guy to stand pat. First of all, no serious economist would ever predict what the stock market will do in a timeframe as short as a week — which raises questions about Moore’s real agenda. “The Heritage Foundation has received funding from organizations with connections to the Koch brothers. In 2012, the Heritage Foundation received $650,000 from the Claude R. Lambe Foundation, which was one of the Koch Family Foundations before it closed in 2013. The Lambe Foundation contributed at least $4.8 million to the Heritage Foundation between 1998 and 2012. The Kochs have launched a multi-year push back to disassociate themselves from front groups. Watch the video as David Koch stands at the podium for an Americans for Prosperity convention and its Tea Party Groups and explains how he and his brother, Charles, provided the start up funds; then make up your own mind. Because of a Board battle in 2012 at the Cato Institute, it came out that for the prior 35 years, as the Cato Institute pumped out its free market, small government white papers by the boatloads under the guise of an independent think tank, Charles and David Koch were two of a handful of men who owned the Institute outright. In addition to their front groups, the Kochs hold super-secretive confabs at tony resorts to map out their political strategy with a 200-plus roster of one-percenters and well-placed media taking heads. In a June 2011 Koch network meeting at the luxury Ritz-Carlton resort in Colorado, the brothers promised the “mother of all wars” to take the White House in 2012. It has been estimated that the pair spent upwards of $400 million in their failed attempt to put the Mitt Romney/Paul Ryan ticket in the White House along with their scheme to privatize Social Security. The bottom line here is this: be very careful where you get your investment advice. Clearly, the right wing has infiltrated the so-called liberal media.